All the taco goodness without the corn. 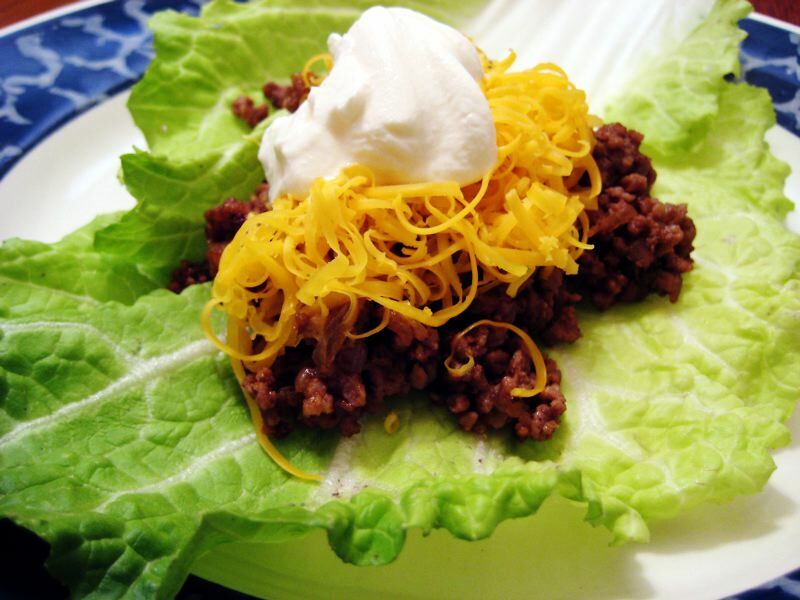 The Napa cabbage provides the alternate crunch and makes it easy to handle. 1. Brown beef and onions then drain excess fat. 2. Add salt, chili powder and garlic and simmer for 5 minutes, adding a little water if necessary to incorporate spices. 3. Serve on Napa cabbage leaves with your choice of toppings. The Napa cabbage is sturdy enough to pick up the taco and not fall apart. Might I suggest some refried beans to go with that? Oh my word! Real live legal tacos??? Thank you for sharing the recipe! My world can now continue to turn! I just stumbled across your site today, while searching for SCD legal guacamole. I LOVE the variety of recipes, and all using REAL ingredients (not things that have to be special ordered). Keep up the good work! Any tips on eating SCD while traveling? When I’m traveling, I try to stay somewhere that I can cook or at least have easy access to at least a microwave and fridge. For eating in transit, I carry non-perishables: jerky, home made biscotti (muffin recipe, baked into biscotti shapes then dehydrated), nuts, dried fruits and seeds. When I’m taking car trips and have room for a cooler, I’ll carry sliced meats, cheeses, stir fry, raw carrots, navy bean hummus, celery, fruits, and muffins to name some. I forgot to address your restaurant question. In short, restaurants are risky. In my opinion and experience, you are likely to get illegals despite the best of intentions. In can be due to communication, lack of understanding, incorrect assumptions, and lack of complete control of ingredients. There are a lot of opportunities for innocent SCD missteps.